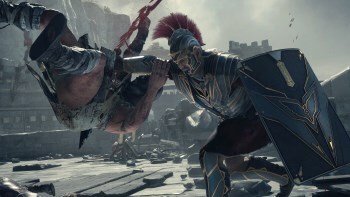 Microsoft says microtransactions in Ryse are strictly about convenience and entirely optional. It came to light yesterday that Ryse, Crytek's $59.99 triple-A launch title for the Xbox One, will support microtransactions, allowing players to purchase booster packs with "random sets of loot" instead of earning them in-game. You can imagine how well that went over, especially since the items in question would appear to give people willing to pay for them an edge over others in multiplayer action. But Microsoft says that's not the case at all. Booster packs come in different tiers that are tied to a player's experience level, meaning that high-level packs won't actually be available until you've advanced far enough into the game. "We specifically do that so you cannot pay to win," Microsoft producer Justin Robey told Eurogamer. "Microtransactions are merely there as a convenience thing for people. It's completely optional and is not required in any way, shape or form for gameplay. All content is accessible without using it." Robey said the microtransactions are there primarily for die-hard collectors who will most likely progress to more advanced tiers before earning all the items at their current level, and noted the actual benefit of buying them in advance is "really slim." The system is also intended to be as "hidden and non-blatant as possible"; he compared Ryse microtransactions to those in Mass Effect 3 and FIFA and said the goal was to come up with something similarly "unobtrusive." "I really want people to understand, it's optional and it's just convenience," he said. "That's it. There's nothing sinister, we promise." Ryse: Son of Rome comes out in November, exclusively for the Xbox One.